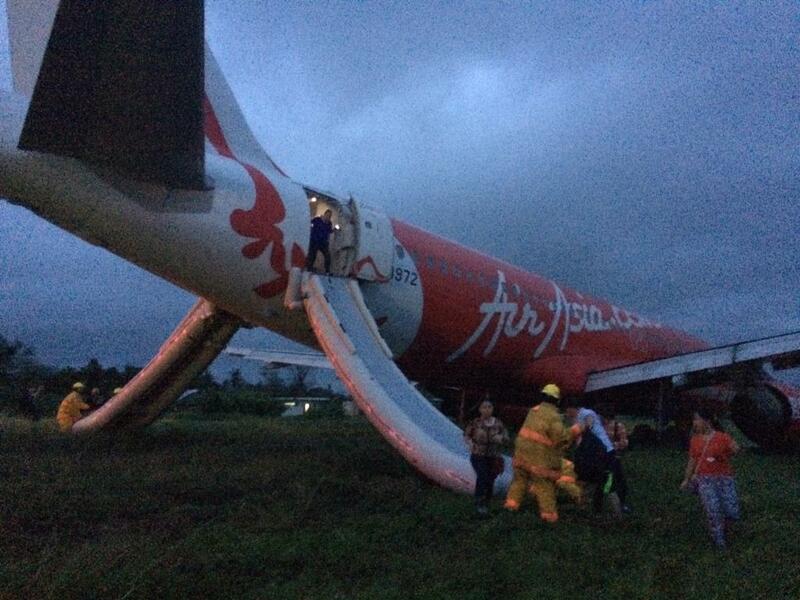 Aviation Updates Philippines - An AirAsia Zest Airbus A320-200 overshot the runway in Kalibo after it landed from Manila in a windy situation at 5:43 PM PHT. AirAsia Zest Flight Z2 272, carrying 159 people on-board, was stuck in a muddy portion of the runway which forced the cancellation of flights this evening. The passenger aircraft's emergency slides were activated to disembark the airline's passengers safely, according to Giovanni Hontomin, who is in charge of AirAsia Zest's operations. There were no reported injuries after the plane overshot the runway of the gateway to Boracay Island. "AirAsia Philippines confirms flight Z2 272 from Manila skidded off the Kalibo International Airport runway at 5.43 PM upon landing," AirAsia said in a statement on Tuesday night. "All 153 passengers and crew were able to disembark safely, no injuries reported. All passengers are now at a hotel assisted by AirAsia staff." 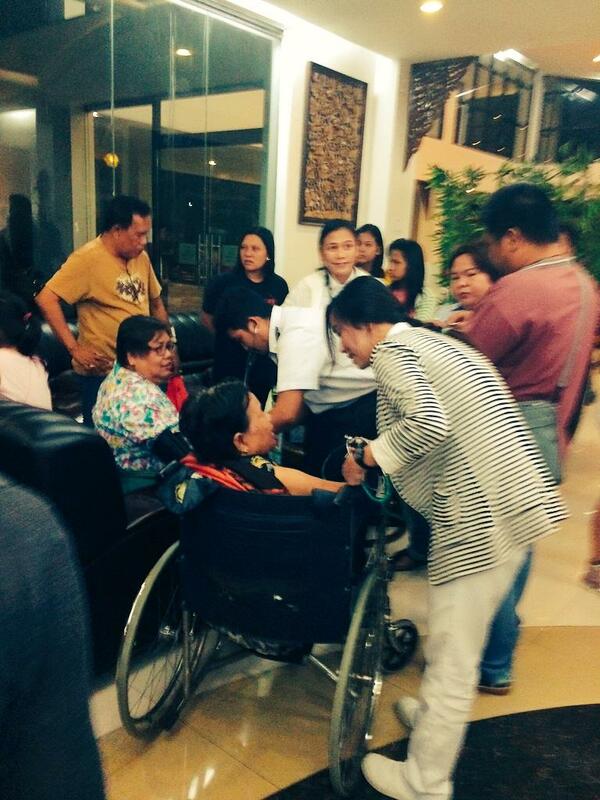 "Elderly passengers of AirAsia flight that overshot runway at Kalibo getting blood pressure checked." RP-C8972, the tail number of the involved aircraft in the incident, was delayed for two hours. The aircraft was supposed to depart at 3:10 PM. According to reports, a Cebu Pacific flight bound for Kalibo from Manila was forced to return to the airport due to bad weather. The bad weather that had caused the incident, a tropical storm, has left landslides and flash floods which took lives of many people. Typhoon Seniang destroyed Php 5 million worth of crops, according to the National Disaster Risk Reduction and Management Council. The mishap forced the airport to be closed at 6:45 PM, cancelling all arriving and departing flights at the Kalibo International Airport. However, the airport has re-opened after several hours of closure due to the incident. The airport resumed its operations after the Civil Aviation Authority of the Philippines lifted the Notice to Airmen (NOTAM) at 2:12 AM. According to the field report by CAAP's Director General William K. Hotchkiss, the staff at the airport successfully removed the aircraft from Runway 23. The Kalibo International Airport's Runway 23 has a length of 2,187 meters, which is capable for narrow-body aircraft such as the Airbus A320-200 and the Airbus A319-100, according to the Aviation Safety Network. Kalibo is the second gateway of tourists to the Island of Boracay, after Caticlan which only accommodates turbo-prop aircraft. Recently, an AirAsia Flight from Surabaya to Singapore crashed into the Java Sea. In a search and rescue operation, the authorities discovered debris from the Airbus A320-200 aircraft, including bodies of passengers on-board. The plane lost contact with the air traffic control on its way to Singapore while travelling over the Java Sea with 162 passengers and crew on-board.